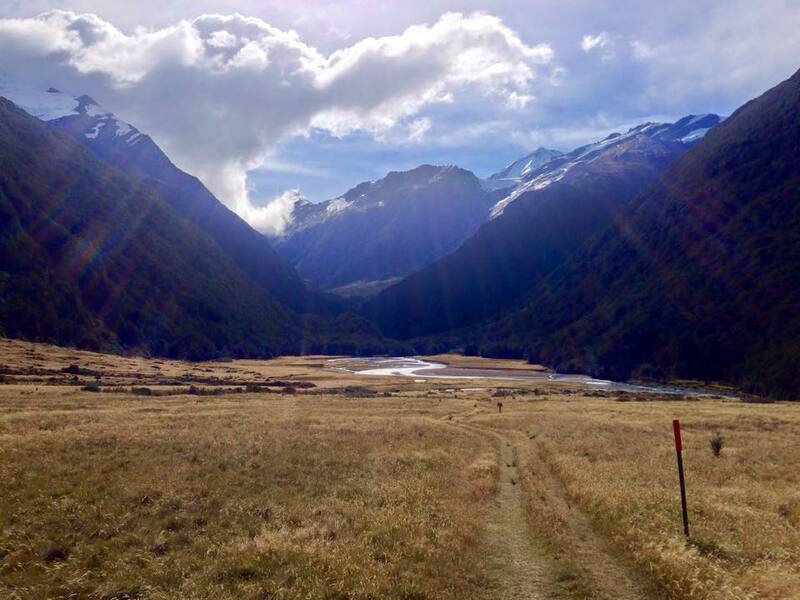 We’d meant to get to the Liverpool or French Ridge huts as the finale to a five-day mission that connected Rees Saddle, Cascade Saddle, and the Matukituki back in February. But a storm of epic proportions confined us to the Aspiring hut for an extra day, thwarting our grand plans to spend our last night at the head of that heavenly valley. Several days later, I met a Swiss girl at the Wanaka DOC office standing in front of the photos of area huts. She gazed at the picture of a little red shack set in a backdrop like a painting and sighed, “The Liverpool hut… my soul…” She couldn’t even find the words to describe how that place had touched her. That shack remained in my mind for two months. One day in early April with the last of the warm weather fading, I jetted down from Christchurch to finally make the journey to the Liverpool hut. 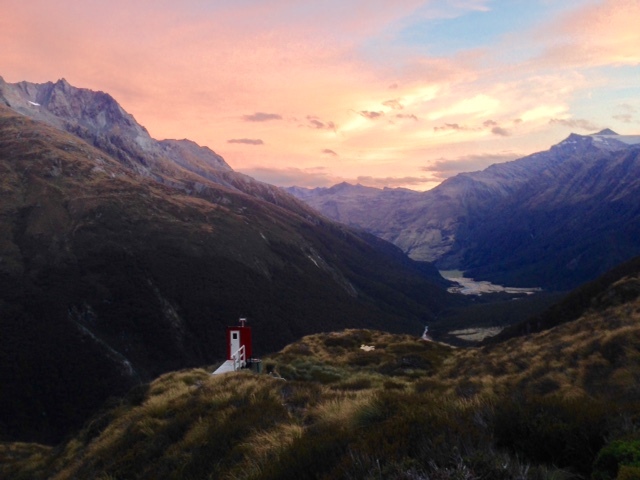 I picked up my travel buddy Stu in Wanaka, and we drove out that night to the trailhead to start hiking in the morning. Lucky the Legnum, usually surprisingly functional despite the increasing roar of her engine, inexplicably sputtered to a stop on a blind curve on the dark dirt road. We tinkered around under her hood, finding nothing. I held my breath and turned the key in the ignition, and Lucky faithfully (and inexplicably) roared back to life. I finally exhaled when I parked her at the trailhead. She’d delivered me to one more adventure. (Anyone’s guess as to whether she’d get us back out). For all its beauty, the first two hours of the hike through the Matukituki are fairly boring. The trail is a four-wheel drive track through pastureland, which leaves trampers dodging cow and sheep piles and slapping flies constantly. After the Aspiring hut, the track passes through spurts of beech forest punctuated by long lovely flats. Stu and I sat at Shovel Flat in a beautiful breeze to enjoy the view for a bit. At Pearl Flat, we stopped for lunch on the banks of the river, and were immediately accosted by all the sandflies that had been mysteriously absent from Shovel Flat. We pulled the classic awkwardly-eat-while-pacing maneuver to outrun the bugs. Lesson: ALWAYS pull out lunch when there’s a breeze. At the end of Pearl Flat, a bridge crosses Liverpool Stream, and you kiss the mellow track goodbye. From here on out, it’s straight the hell up all the way to the Liverpool hut. No switchbacks, no mercy; just vertical rootwads, slick rocks, and creative moves. 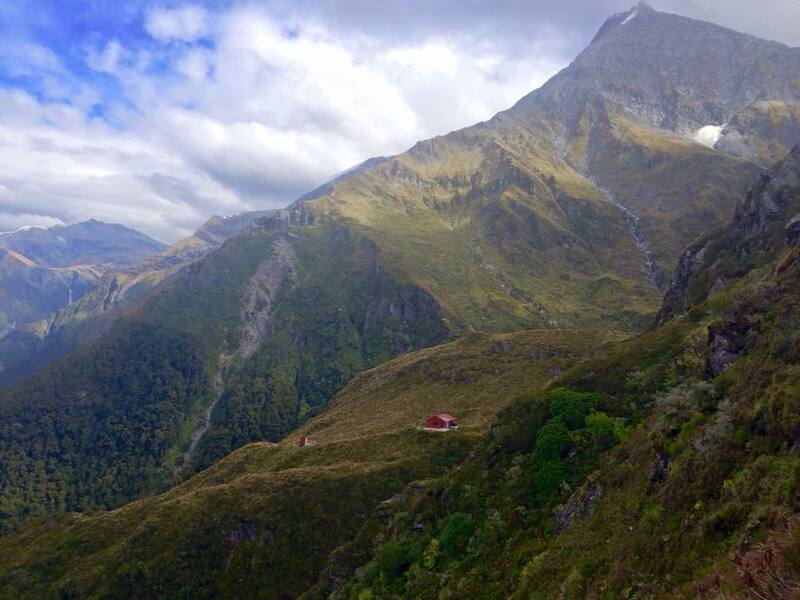 It’s likely the steepest track I’ve hiked in New Zealand. An hour later, we cleared the bushline to stunning vistas of glaciers leaking into fairytale waterfalls down steep mountain faces. And finally, our sweat freezing in the cold wind blowing off snow-covered peaks, we were rewarded with the sweetest view of the Liverpool hut balanced on a little plateau high above the valley. Liverpool is a ten-bunk hut that is absolutely and unquestionably worth the 5-6 hour, steep-as-hell hike to get to it. 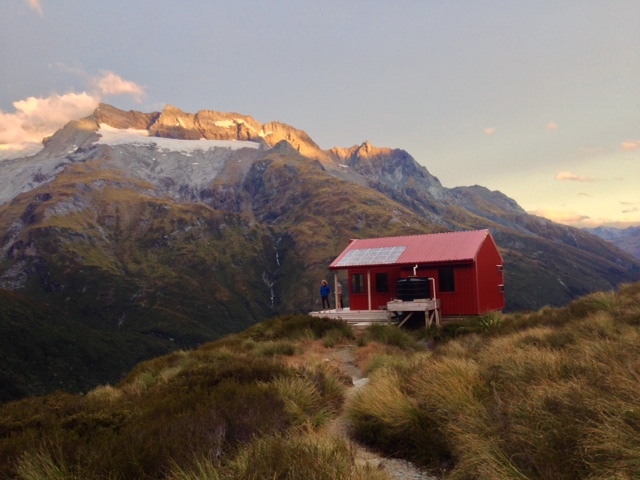 It offers views in all directions: back down the valley to the sea of mountains beyond, and the mythical Cascade Saddle; Mount Avalanche and Rob Roy Peak across the valley; Mount Liverpool and Mount Barff towering above the hut. 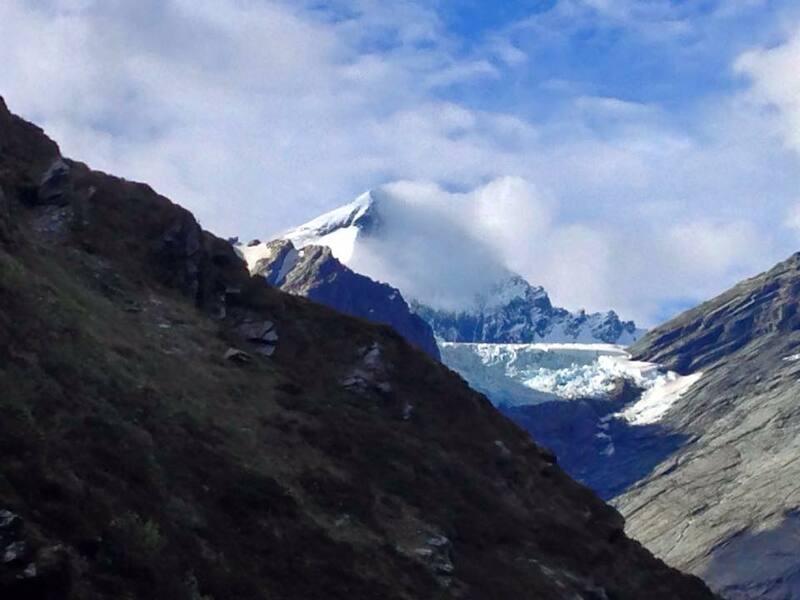 And the motherlode: Mount Aspiring reigning over the Matukituki, snow blowing from her high peak and sawtooth ridgeline. Stu and I immediately dragged mattresses, sleeping bags, and snacks out onto the deck, and refused to move for several hours. When two other people showed up in the late afternoon, we shared the mattress couch to watch the unbelievable sunset with wine and hot chocolate in hand. Alpineglow lit the tops and the clouds turned to fire. When the last light faded from Mount Aspiring, we were breathless from the beauty, graced in it, blissed out from our luck at seeing it. We retreated from the cold into the hut, periodically stepping from its candlelit warmth to gaze at the millions of stars overhead. We awoke in the morning enveloped in cloud, the landscape from the night before a dream. We started back down the trail to the valley, chased by rain. Back at the carpark, Lucky the Legnum started. I’m happy to report that she’s delivered me to many more adventures since. I think she’s got a couple more in her future.